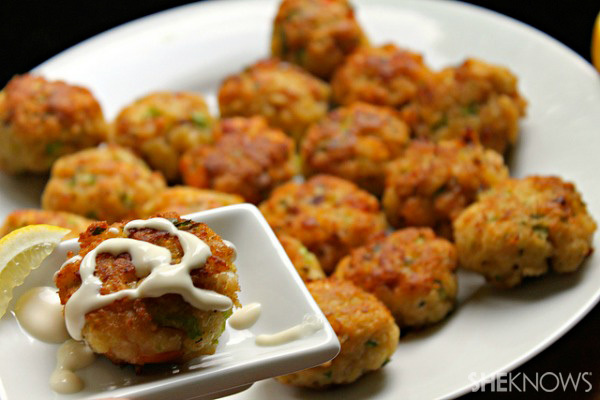 These delightful little shrimp cakes are wonderful served with a creamy, tangy mayonnaise sauce! We made these shrimp cakes hors d’oeuvre-size but they can certainly be made larger for an entree portion. Just leave them in the oven a bit longer to see that they’re cooked and warmed through! Marinate the shrimp in olive oil, Old Bay and garlic for at least 20 minutes or up to an hour. Coat a large frying pan with canola oil and place over medium-high heat. Place the shrimp in the pan and cook (in batches) about 2 minutes total. Remove shrimp from the heat, allow them to cool a bit and then dice the shrimp well (at this point the shrimp are par cooked). Preheat oven to 350 degrees F. Add chopped shrimp to a large bowl. Add scallion, cilantro, green pepper, mustard, hot sauce, mayonnaise, egg and breadcrumbs and mix together well. Form mixture into desired size shrimp cakes (we made mini cakes, about 2-3 bites each). Set aside. Add additional oil to the frying pan, once hot, carefully add a few shrimp cakes at a time, careful not to overcrowd the pan. Cook approximately 2 minutes on each side, until browned. Place fried shrimp cakes on a flat pan and place in the preheated oven for 1-3 minutes to ensure they cooked through and hot. Serve with the lemon mayonnaise (recipe follows). Mix together all ingredients. Taste and adjust if needed. Serve with shrimp cakes.